Water-Lubricated, Self-Locking System for round-bore housings. Benefits of Johnson Demountable Bearing in round bore applications. Johnson Demountable System is precision fitted to shaft journal. 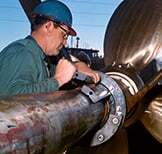 Procedures at Duramax Marine include a complete fitting of all bearings and measurement of proper clearance before the system is packed and shipped. The ID of your Demountable System is machined to the proper dimensions. The complete bearing is then assembled in a tube of identical dimensions to those shown on your engineering drawings. Compression head is applied to verify an accurate fit. Finally, the bearing ID is checked for proper size. Clearances around the shaft are measured and recorded. A copy of the pertinent data & installation instructions for your specific installation accompanies the bearing. 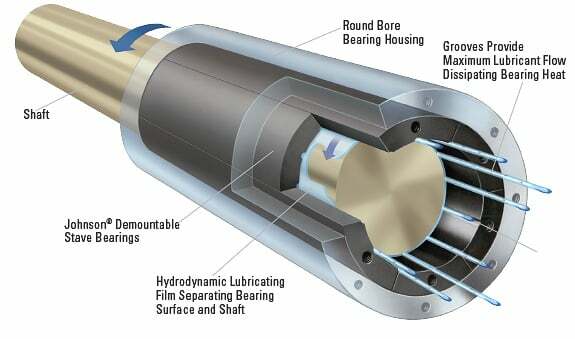 Hydrodynamic Design Separates Shaft And Bearing. 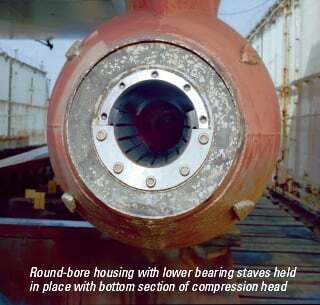 At shaft speeds in excess of 1m/sec (3.25 ft/sec), a hydrodynamic water wedge is created, separating the shaft from the bearing surface at the “Effective Area” of the bearing. 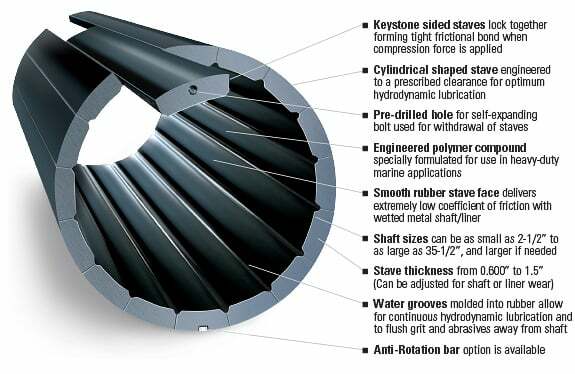 A continuous hydrodynamic film of water is supplied through grooves to the sliding surfaces, minimizing frictional heat and extending wear life of the shaft and bearing. Because of the forgiving properties of the rubber stave, harmful abrasives and contaminants are pressed into stave surface, then flushed into the grooves away from shaft. The “keystone” shape of the molded stave and frictional bonding will help secure bearing in the housing. You just place the staves around the inside of the round bore housing. The staves are sized to extend slightly after full insertion into housing. 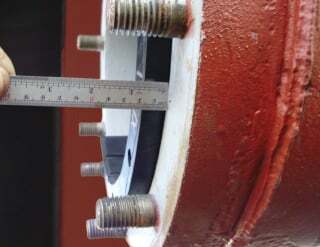 Once they are in place, a compression head or stuffing box is installed. It exerts longitudinal pressure producing a “keystone” action on the angled sides of the entire stave complement. The nitrile rubber staves undergo “controlled deformation”. The molded stave is properly dimensioned to provide the correct compression force and secured bearing I.D. when in the locked position. Easy to inspect and replace bearing without removing shaft. 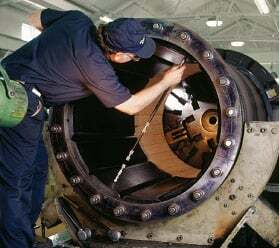 When bearing clearance due to wear exceeds 50% of the original clearance, it’s time for the bearing to be renewed, to maintain optimal performance. Two replacement sizes are available to maintain proper bearing clearance due to wear. Johnson Demountable Precision Fitted Staves come in 3 different I.D./Journal sizes for every basic housing bore. We provide the original bearing size precision fitted to journal, along with two replacement sizes in larger increments to fit a refinished shaft liner, extending the life of a shaft liner. 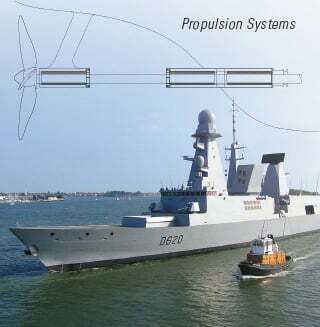 To determine the combination of stave lengths your application requires see the Demountable Selection Guide on pgs 18-19, or call Duramax Marine at +1 440.834.5400. 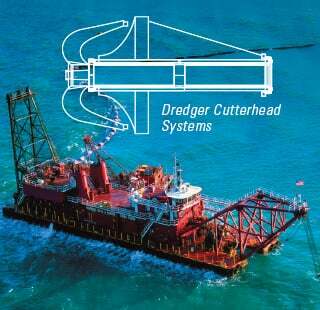 Easy inspection, less maintenance time, reduced replacement cost, and longer shaft life makes it a cost-effective bearing solution for any type vessel.